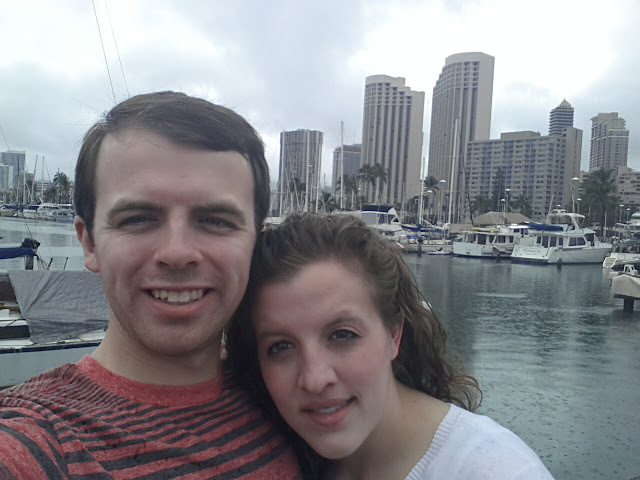 My husband and I loved our honeymoon to Hawaii! We are both huge LOST fans and really enjoyed going on Lost Virtual Tours. This is the 2nd part of the touring. I posted the 1st part earlier. The large pictures are the ones we took - the small ones are pictures from the show found on the virtual tour website. It rained A LOT on the island, so this was a great thing to do on rainy days. It also brought us to some pretty amazing homes and areas on the island. Jack sees a vision of his childhood home in the episode in season 6 called "Lighthouse." This church is used in the last 2 seasons. Ben brings Sun &.Jack to the church in the end and they meet Desmond there. In the last episode, Hurley comes out on the balcony and talks to Ben who is sitting in the courtyard. We had to get pictures through the fence because it's a school for girls - so you can't go in. Any shots of the inside of the church are actually from the church next door - St. Patrick's Church. This is the house Hurley buys for his mom after he wins the lottery. It's the one that catches on fire in the show. The people who own the house were home, so they probably thought we were creepers. We met other LOSTees on our tours, so I wonder if they are used to it by now. This is one of the houses they used for Anthony Cooper's house - John Locke's dad who steals his kidney. This is where Helen makes John choose between her or his father. Hurley's house. It plays a big role when Hurley brings Sayid here when he's in trouble. Ana Lucia drops Christian off at a bar where he meets Sawyer. The inside of the bar scene is actually from the Harbor Pub down the street. Jae falls to his death on a car in the valet next to Jin. Boone goes to Australia to get Shannon. Desmond & Penny get their picture here. Desmond & Charlie drive a car into the harbor. This area was used for a lot of stuff. It's also where the Waikiki Yacht club is - used for Ben gathering the Oceanic 6 and Ben shoots Desmond. We reenacted the Desmond & Penny picture! This was actually used as the airport throughout the show. Jack tries to get his dad's body on the plane, Sun decides not to leave Jin, Hurley runs for the plane - basically any airport scene. Also, they used the escalators a lot. There was no where to park around here and they are very picky about people getting in, so we just took pictures driving by. Locke gets pushed out of a building by his dad. Jacob touches Locke. Jin works as a hotel doorman. We had so much fun in Hawaii! Thanks for letting me share our journey with you!